DotA is arguably one of the more popular, if not the biggest game in Malaysia, South East Asia and especially up north China. To acknowledge the fact and to celebrate all the top talents from each countries around the region, DotA 2 The Asia has been organised. 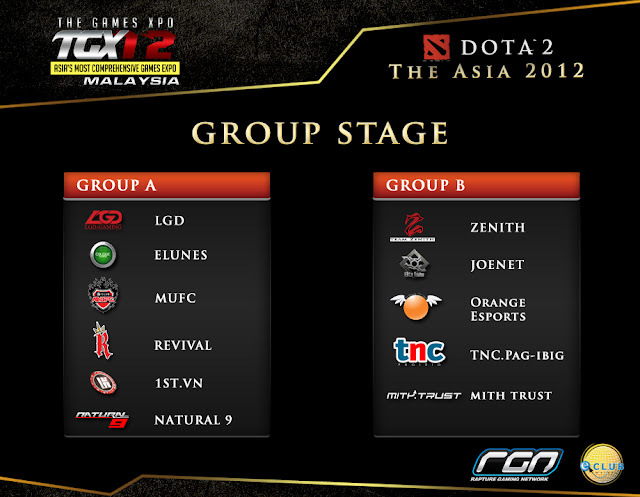 DotA 2 The Asia will be held from the 22 to the 23rd of December in conjunction with TGX (The Game Expo) Malaysia 2012 and its group stages and schedule have recently been announced. I would say that both groups are fairly balanced, with probably LGD or MUFC (if they perform at their best) taking the lead in Group A, while Zenith and Orange having a good chance in Group B. But don't get me wrong, all the other teams are equally competitive, but track records have shown that China's LGD and both Malaysia's Orange and MUFC to be the better contenders for this year's one of the biggest regional DotA 2 tournament. 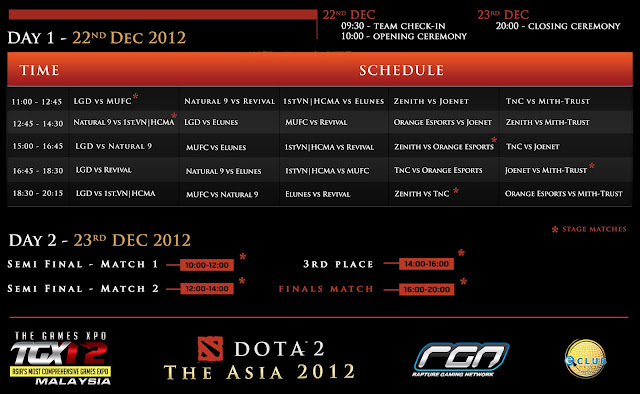 The official schedule, click image to enlarge.